Find out more about these sensitive, inquisitive and smart animals. 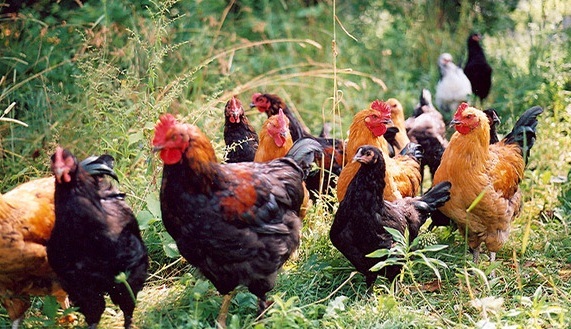 "Chickens exist in stable social groups. They can recognise each other by their facial features. They have 24 distinct cries that communicate a wealth of information to one other, including separate alarm calls depending on whether a predator is travelling by land or sea. They are good at solving problems. As a trick at conferences I sometimes list these attributes, without mentioning chickens, and people think I'm talking about monkeys." Notes Dr. Chris Evans, Professor of Psychology at Macquarie University, Australia. He goes on to say that, "Perhaps most persuasive is the chicken's intriguing ability to understand that an object, when taken away and hidden, nevertheless continues to exist. This is beyond the capacity of small children." Jungle fowl and their modern counterparts are omnivores who spend a large part of their waking time pecking and scratching at the ground for food. Their beaks are especially adapted for this activity, with a high concentration of touch receptors and sensory nerves. The well-known author and zoologist Dr Desmond Morris has pointed out that studies of birds have shown that their world is subtle and complex, and that they have a complicated set of drives and responses - all of which are denied in factory farms. As well as scratching and foraging, another important natural behaviour is nesting when a hen wants to lay an egg. A hen in a cage cannot satisfy this most natural urge to build a nest then lay her egg in privacy. Caged hens cannot do many other things that nature intended including stretching and flapping their wings, perching and dust-bathing. All of this adds to the behavioural signs of chronic frustration which have been observed in many studies of caged hens. Even though chickens were domesticated some 8000 years ago - we are still in our infancy in fully understanding their uniqueness. It is clear that chickens have capabilities, natural instincts and behavioural needs well beyond what many have considered. To deny them the opportunity to engage in natural behaviours that bring quality of live is in itself cruel. 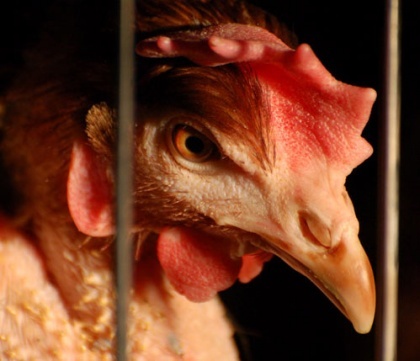 Each chicken is an individual living being capable of feeling joy, fear, pain and frustration. These sensitive and interesting animals have done nothing to deserve a life sentence of suffering in today's factory farms. It's time to set them free. It's time to Make it Possible. Thinking differently about chickens? Enjoy the poignant stories of Autumn and Willow - two lucky chickens who each escaped the cruel fate that factory farming had intended for them.